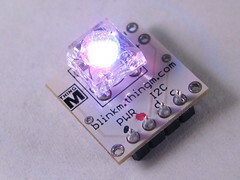 BlinkMs are available from FunGizmos.com, SparkFun (US) and other electronics vendors. It's hard to show in just static pictures how fun and easy it is to play with BlinkMs, so here's a few quick video guides. A video version of the BlinkM Quick Start Guide. A demonstration of one of the example Arduino sketches "BlinkMTester", which lets you exercise a BlinkM by typing simple commands to the Arduino. More examples will be added periodically. For the Arduino examples, a convenience library called BlinkM_funcs.h has been created. Just drop this .h file into your sketch folder and call the functions to start playing with BlinkM. The complete list of functions is below, though you'll probably only use a few of them for a particular project. 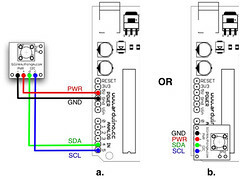 For more information, including a datasheet, example code and sequencer application for Mac/Windows/Linux visit blinkm.thingm.com. If you want to talk about BlinkM, leave a comment or participate in discussions on ThingM's Satisfaction page.